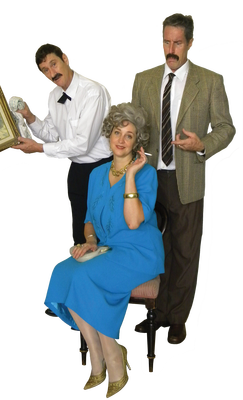 MARRIAGE MAYHEM: Ross Mathers and real-life couple Matt and Tarina Barker as Manuel and Basil and Sybil Fawlty. A Fawlty Towers dinner extravaganza will serve up real-life chemistry when it comes to the Sphinx on 25 August. Acting couple Matt and Tarina Barker play Basil and Sybil Fawlty in “two solid hours” of “mayhem” in their tribute to the iconic British series. “My wife and I created the show a couple of years ago with another chap who’s been a friend of ours for a long time,” Matt told the Indy. The Fawlty Towers Dinner Dance was one of many times the couple had played husband and wife together on stage and TV. In fact, they eloped onstage well before their real-life marriage in 1987. “Tarina and I met during a stage show in 1984 – we were cast as husband and wife,” Matt said. Next they scored husband and wife roles in another British favourite, Australian TV series Neighbours, and a TV commercial. “We thought – hello – there’s something going on here,” Matt said. They were married almost 20 years when they created the Fawlty Towers Dinner Dance. “I’d never even seen all the episodes,” Matt said. So he watched the series back-to-front to study John Cleese playing the bombastic Basil. “Whenever I try to impersonate someone I try to get the voices and mannerisms right,” he said. The “interactive dinner experience was half-scripted and half ad-lib, with the characters performing one song each, Matt said. He likes performing for Fawlty newcomers along with their parents and grandparents at the show. “Our show’s designed so they don’t have to know what the original’s about,” he said. Ross Mathers joins the couple as bumbling waiter Manuel, despite his less clumsy background as a former acrobat for Circus Oz. “Sybil does a very good job trying to keep us two nutcases under control,” Matt said. The show also features The Baby Boomers Duo performing a 75-minute set of hits from the ‘50s through to the ‘80s. “We’ve got more for the audience than just a two-hour show,” Matt said.